You are here: Home » MEDIA » Books » Degenesis: Black Atlantic by Marko Djurdjevic (book review). ‘Degenesis: Black Atlantic’. What we have here is part-book, part-game whicah when combined result in a work of art that would grace a coffee table in the most luxurious of homes. It is a large format full colour 274 page hardback which oozes quality. It even has its own page marker fitted as standard. That’s all very good but what is ‘Degenesis’? 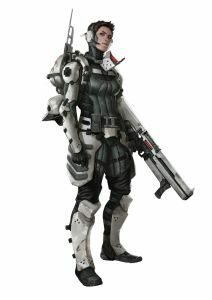 Well, ‘Degenesis’ is a table top role-playing game played in the far future where humanity seems to be heading for extinction. I suppose a post-apocalyptic rpg would be a fitting description, but it doesn’t really do it justice. It has even won an award in its native land Germany where it seems to be quite popular and in France and Spain. I’m not sure why it doesn’t have a larger following here in the UK. Anyway, a lot has happened to the world in this far future which makes it harder for a human to stay alive. Other life-forms seem to be doing nicely, though. As always with these types of games it needs and, in fact, depends on a Games Master. 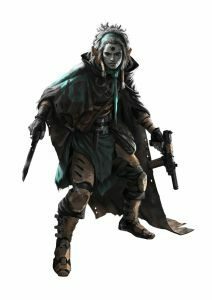 The GM sets the scene, mediates between the characters and drives the game along. The book is a GM’s treasure trove, packed with information and glorious artwork. ‘Degenesis’ first appeared in 2005 and well-deserved credit should go to the creators Christian Günther and Marko Djurdjevic. It has gone through a number of revisions over the years and there have been a few books published along the way, too. It would be remiss of me not to mention the two video trailers that are also available to view on the Internet. In this post-apocalyptic world there are 7 human cultures with 13 cults. Some of the cults are allied together and some are neutral. Of course, humans being humans, some clans are at war with each other or at least don’t like each other very much. Players get to choose characters whose actions and attributes are largely defined by the cult they belong to. Ranged against the humans are 8 types of mutant spawn which are the product of Homo Degenesis. 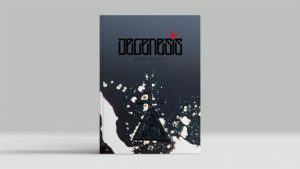 It would be apt to explain that Homo Degenesis are the result of a virus that arrived on Earth travelling underneath the icy shell of asteroids. Once established, it started infecting humanity‘s DNA. The virus transformed ordinary people turning them into a new race of human beings. 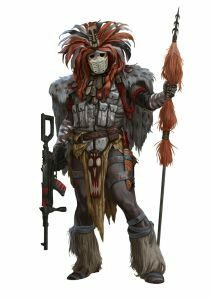 These new beings, Homo Degenesis, with their psychic powers want to exterminate the lowly Homo Sapiens. While the previous two books were centred on southern Europe and North Africa, ‘Black Atlantic’ covers northern Europe and southern Briton. Opening the front cover of the book reveals a map showing you just which where the action takes place. It is titled Northwestern Coast of Franka 2597 A.D. On page 2, we meet the people who put this all together and it’s a rather large team led by Marko Djurdjevic, who is credited with being the author for this book. The publisher is SIXMOREVODKA. An odd name for a publisher but seeing what they have published, I think a few vodkas to celebrate are in order. The book ‘Degenesis: Black Atlantic’ is divided into 4 chapters proceeded by a short prologue. Chapter 1: ‘Starfire’ runs from page 8 to 83. It’s a mixture of background narrative of the places and the peoples, fact sheets and mini-missions to equip your brave characters with useful items. It ends with a two page spread detailing the timeline from the year 2390 up to 2597. Chapter 2: ‘Burnt Idols’ introduces the main characters of each of the 13 cults. A profile is provided for each character detailing their various attributes and skills. While it might sound boring, each character has a half-page narrative which in itself is compelling reading. Things get interesting in Chapter 3: ‘Black Atlantic’, as there’s a section titled ‘Before The Game’ which just happens to mention that the only way to experience Black Atlantic’s full potential is for the GM to have read the previous books. We are talking about ‘In Thy Blood’ and ‘The Killing Game’. Reading on a bit more and I’m relieved to see that it is possible to play ‘Black Atlantic’ without playing the previous games and they have provided some helpful advice on how to do so. What isn’t mentioned is that you do need the core rules book. These aren’t included in ‘Black Atlantic’. After that sly sales pitch for the previous books, the game gets seriously underway with ‘Act 1: Black Water’. This is set in the fish market of the city of Brest. It’s a misty autumn morning and the locals are having a stiff drink or two to keep their spirits up. There’s an air of expectation as a fisherman attaches a chain to a wrench and starts to lift a fishing boats cargo. So, the first scene is set and the action starts. There’s not much time and choices need to be taken quickly. Just reading it is exciting and I’m not a GM or a player, just a lowly reviewer. Assuming you make it out of the first scene, the rest come thick and fast with the odd descriptive texts helping to add more ambiance to an atmosphere so thick you could cut it with a knife. There are 19 scenes split over 3 Acts to survive before Chapter 3 draws to a close. Chapter 4: ‘Thrown To The Gods’ provides the grand finale and is a fitting end to this episode of ‘Degenesis’ even though it is the shortest of the four chapters with only 2 scenes. There is however, an epilogue followed by an Experience and Rewards section where your weary characters can reap their rewards. There’s rather a good section on the black water Leviathans to finish up on. But not quite. Inside the back cover, there’s a map of Brest as it is in 2597 A.D. I must admit I thought the game scenarios and character options were very, very good. The gameplay doesn’t get in the way once you get used to it. It’s like anything in life, there’s a learning curve but it’s well worth putting in the effort. What really sets ‘Degenesis: Black Atlantic’ apart as a book though is the artwork, layout of the pages and the depth of the background information and short stories. It really is a top-quality item that’s a joy to read cover to cover or even just to browse. This may be its downfall. Who in their right mind is going to want to lend out such an expensive quality item? That’s the problem right there as, to get the most from the game, the players need to have some knowledge of the world, the civilisations, the clans, weapons, abilities and the mutant foes. How are they going to get that knowledge? I’m not lending my copy out to anyone. It’s mine. Mine! My precious. « Kronos (1957) (a film retrospective by Mark R. Leeper).